For the country, see Central African Republic. For the region of the African Union, see Regions of the African Union § Central. 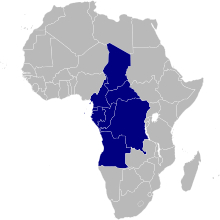 Central Africa is the core region of the African continent which includes Burundi, the Central African Republic, Chad, the Democratic Republic of the Congo, and Rwanda. Middle Africa (as used by the United Nations when categorizing geographic subregions) is an analogous term that includes Angola, Cameroon, the Central African Republic, Chad, the Democratic Republic of the Congo, Equatorial Guinea, Gabon, the Republic of the Congo, and São Tomé and Príncipe. All of the states in the UN subregion of Middle Africa, plus those otherwise commonly reckoned in Central Africa (11 states in total), constitute the Economic Community of Central African States (ECCAS). Since its independence in 2011, South Sudan has also been commonly included in the region. The Central African Federation (1953–1963), also called the Federation of Rhodesia and Nyasaland, was made up of what are now the nations of Malawi, Zambia, and Zimbabwe. Similarly, the Anglican Church of the Province of Central Africa covers dioceses in Botswana, Malawi, Zambia and Zimbabwe, while the Church of Central Africa, Presbyterian has synods in Malawi, Zambia and Zimbabwe. These states are now typically considered part of East or Southern Africa. The basin of Lake Chad has historically been ecologically significant to the populations of Central Africa, with the Lake Chad Basin Commission serving as an important supra-regional organization in Central Africa. Archeological finds in Central Africa have been discovered dating back over 100,000 years. According to Zangato and Holl, there is evidence of iron-smelting in the Central African Republic and Cameroon that may date back to 3000 to 2500 BCE. Extensive walled settlements have recently been found in Northeast Nigeria, approximately 60 km (37 mi) southwest of Lake Chad dating to the first millennium BCE. Trade and improved agricultural techniques supported more sophisticated societies, leading to the early civilizations of Sao, Kanem, Bornu, Shilluk, Baguirmi, and Wadai. Around 1000 BCE, Bantu migrants had reached the Great Lakes Region in Central Africa. Halfway through the first millennium BCE, the Bantu had also settled as far south as what is now Angola. The Sao civilization flourished from ca. the sixth century BCE to as late as the sixteenth century CE in northern Central Africa. The Sao lived by the Chari River south of Lake Chad in territory that later became part of Cameroon and Chad. They are the earliest people to have left clear traces of their presence in the territory of modern Cameroon. Today, several ethnic groups of northern Cameroon and southern Chad but particularly the Sara people claim descent from the civilization of the Sao. Sao artifacts show that they were skilled workers in bronze, copper, and iron. Finds include bronze sculptures and terra cotta statues of human and animal figures, coins, funerary urns, household utensils, jewelry, highly decorated pottery, and spears. The largest Sao archaeological finds have been made south of Lake Chad. Note: BCE is the same as BC and CE is the same as AD. The Kanem-Bornu Empire was centered in the Chad Basin. It was known as the Kanem Empire from the 9th century CE onward and lasted as the independent kingdom of Bornu until 1900. At its height it encompassed an area covering not only much of Chad, but also parts of modern southern Libya, eastern Niger, northeastern Nigeria, northern Cameroon, parts of South Sudan and the Central African Republic. The history of the Empire is mainly known from the Royal Chronicle or Girgam discovered in 1851 by the German traveller Heinrich Barth. Kanem rose in the 8th century in the region to the north and east of Lake Chad. The Kanem empire went into decline, shrank, and in the 14th century was defeated by Bilala invaders from the Lake Fitri region. The Kanuri people led by the Sayfuwa migrated to the west and south of the lake, where they established the Bornu Empire. By the late 16th century the Bornu empire had expanded and recaptured the parts of Kanem that had been conquered by the Bulala. 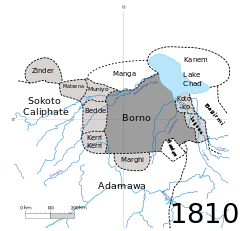 Satellite states of Bornu included the Damagaram in the west and Baguirmi to the southeast of Lake Chad. The Shilluk Kingdom was centered in South Sudan from the 15th century from along a strip of land along the western bank of White Nile, from Lake No to about 12° north latitude. The capital and royal residence was in the town of Fashoda. The kingdom was founded during the mid-fifteenth century CE by its first ruler, Nyikang. During the nineteenth century, the Shilluk Kingdom faced decline following military assaults from the Ottoman Empire and later British and Sudanese colonization in Anglo-Egyptian Sudan. The Kingdom of Baguirmi existed as an independent state during the 16th and 17th centuries southeast of Lake Chad in what is now the country of Chad. Baguirmi emerged to the southeast of the Kanem-Bornu Empire. The kingdom's first ruler was Mbang Birni Besse. Later in his reign, the Bornu Empire conquered and made the state a tributary. The Wadai Empire was centered on Chad and the Central African Republic from the 17th century. The Tunjur people founded the Wadai Kingdom to the east of Bornu in the 16th century. In the 17th century there was a revolt of the Maba people who established a Muslim dynasty. At first Wadai paid tribute to Bornu and Durfur, but by the 18th century Wadai was fully independent and had become an aggressor against its neighbors. Following the Bantu Migration from Western Africa, Bantu kingdomes and empires began to develop in southern Central Africa. In the 1450s, a Luba from the royal family Ilunga Tshibinda married Lunda queen Rweej and united all Lunda peoples. Their son Mulopwe Luseeng expanded the kingdom. His son Naweej expanded the empire further and is known as the first Lunda emperor, with the title Mwata Yamvo (mwaant yaav, mwant yav), the "Lord of Vipers". The Luba political system was retained, and conquered peoples were integrated into the system. The mwata yamvo assigned a cilool or kilolo (royal adviser) and tax collector to each state conquered. Numerous states claimed descent from the Lunda. The Imbangala of inland Angola claimed descent from a founder, Kinguri, brother of Queen Rweej, who could not tolerate the rule of mulopwe Tshibunda. Kinguri became the title of kings of states founded by Queen Rweej's brother. The Luena (Lwena) and Lozi (Luyani) in Zambia also claim descent from Kinguri. During the 17th century, a Lunda chief and warrior called Mwata Kazembe set up an Eastern Lunda kingdom in the valley of the Luapula River. The Lunda's western expansion also saw claims of descent by the Yaka and the Pende. The Lunda linked Central Africa with the western coast trade. The kingdom of Lunda came to an end in the 19th century when it was invaded by the Chokwe, who were armed with guns. By the 15th century CE, the farming Bakongo people (ba being the plural prefix) were unified as the Kingdom of Kongo under a ruler called the manikongo, residing in the fertile Pool Malebo area on the lower Congo River. The capital was M'banza-Kongo. With superior organization, they were able to conquer their neighbors and extract tribute. They were experts in metalwork, pottery, and weaving raffia cloth. They stimulated interregional trade via a tribute system controlled by the manikongo. Later, maize (corn) and cassava (manioc) would be introduced to the region via trade with the Portuguese at their ports at Luanda and Benguela. The maize and cassava would result in population growth in the region and other parts of Africa, replacing millet as a main staple. By the 16th century, the manikongo held authority from the Atlantic in the west to the Kwango River in the east. Each territory was assigned a mani-mpembe (provincial governor) by the manikongo. In 1506, Afonso I (1506–1542), a Christian, took over the throne. Slave trading increased with Afonso's wars of conquest. About 1568 to 1569, the Jaga invaded Kongo, laying waste to the kingdom and forcing the manikongo into exile. In 1574, Manikongo Álvaro I was reinstated with the help of Portuguese mercenaries. During the latter part of the 1660s, the Portuguese tried to gain control of Kongo. Manikongo António I (1661–1665), with a Kongolese army of 5,000, was destroyed by an army of Afro-Portuguese at the Battle of Mbwila. The empire dissolved into petty polities, fighting among each other for war captives to sell into slavery. Kongo gained captives from the Kingdom of Ndongo in wars of conquest. Ndongo was ruled by the ngola. Ndongo would also engage in slave trading with the Portuguese, with São Tomé being a transit point to Brazil. The kingdom was not as welcoming as Kongo; it viewed the Portuguese with great suspicion and as an enemy. The Portuguese in the latter part of the 16th century tried to gain control of Ndongo but were defeated by the Mbundu. Ndongo experienced depopulation from slave raiding. The leaders established another state at Matamba, affiliated with Queen Nzinga, who put up a strong resistance to the Portuguese until coming to terms with them. The Portuguese settled along the coast as trade dealers, not venturing on conquest of the interior. Slavery wreaked havoc in the interior, with states initiating wars of conquest for captives. The Imbangala formed the slave-raiding state of Kasanje, a major source of slaves during the 17th and 18th centuries. During the Conference of Berlin in 1884-85 Africa was divided up between the European colonial powers, defining boundaries that are largely intact with today's post-colonial states.On 5 August 1890 the British and French concluded an agreement to clarify the boundary between French West Africa and what would become Nigeria. A boundary was agreed along a line from Say on the Niger to Barruwa on Lake Chad, but leaving the Sokoto Caliphate in the British sphere. Parfait-Louis Monteil was given charge of an expedition to discover where this line actually ran. On 9 April 1892 he reached Kukawa on the shore of the lake. Over the next twenty years a large part of the Chad Basin was incorporated by treaty or by force into French West Africa. 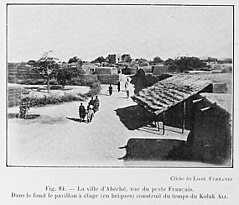 On 2 June 1909, the Wadai capital of Abéché was occupied by the French. The remainder of the basin was divided by the British in Nigeria who took Kano in 1903, and the Germans in Cameroon. The countries of the basin regained their independence between 1956 and 1962, retaining the colonial administrative boundaries. In 2011, South Sudan gained its independence from the Republic of Sudan after over 50 years of war. In the 21st century, many jihadist and Islamist groups began to operate in the Central African region, including the Seleka and the Ansaru. The main economic activities of Central Africa are farming, herding and fishing. At least 40% of the rural population of northern and eastern Central Africa lives in poverty and routinely face chronic food shortages. Crop production based on rain is possible only in the southern belt. Flood recession agriculture is practiced around Lake Chad and in the riverine wetlands.Nomadic herders migrate with their animals into the grasslands of the northern part of the basin for a few weeks during each short rainy season, where they intensively graze the highly nutritious grasses. When the dry season starts they move back south, either to grazing lands around the lakes and floodplains, or to the savannas further to the south. In the 2000-01 period, fisheries in the Lake Chad basin provided food and income to more than 10 million people, with a harvest of about 70,000 tons. Fisheries have traditionally been managed by a system where each village has recognized rights over a defined part of the river, wetland or lake, and fishers from elsewhere must seek permission and pay a fee to use this area. The governments only enforced rules and regulations to a limited extent. Local governments and traditional authorities are increasingly engaged in rent-seeking, collecting license fees with the help of the police or army. Oil is also a major export of the countries of northern and eastern Central Africa, notably making up a large proportion of the GDPs of Chad and South Sudan. Following the Bantu Migration, Central Africa is primarily inhabited by Bantu peoples and Bantu languages predominate. These include the Mongo, Kongo and Luba peoples. Central Africa also includes many Nilo-Saharan and Niger-Congo Ubangian communities: in north western Central Africa the Nilo-Saharan Kanuri predominate. Most of the Ubangian speakers in Africa (often grouped with Niger-Congo) are also found in Central Africa, such as the Gbaya, Banda and Zande, in northern Central Africa. Notable Central African supra-regional organizations include the Lake Chad Basin Commission and the Economic Community of Central African States. The predominant religions of Central Africa and Christianity and traditional faiths. Islam is also practiced in some areas in Chad and the Central African Republic. Due to common historical processes and widespread demographic movements between the countries of Central Africa before the Bantu Migration into much of southern Central Africa, the cultures of the region evidence many similarities and interrelationships. Similar cultural practices stemming from common origins as largely Nilo-Saharan or Bantu peoples is also evident in Central Africa including in music, dance, art, body adornment, initiation and marriage rituals. ^ "Composition of macro geographical (continental) regions, geographical sub-regions, and selected economic and other groupings". United Nations. 2013-10-31. Retrieved 2015-01-28. ^ "Economic Community of Central African States". Africa-Union.org. 2007. Archived from the original on 2007-12-14. Retrieved 2007-12-16. ^ a b c "The World Factbook: South Sudan". World Factbook. Central Intelligence Agency. Retrieved 2013-12-31. ^ http://www.upi.com/Top_News/US/2013/12/24/US-Marines-poised-to-enter-South-Sudan/UPI-73481387863000/: "Secretary-General Ban Ki-moon requested the surge in U.N. peacekeepers, saying the troops would be used to help protect tens of thousands of civilians under siege in the landlocked 2-year-old Middle Africa nation." ^ "The Central African Federation". Encyclopædia Britannica. 2007. Retrieved 2007-12-16. ^ Zangato, É.; Holl, A. F. C. (2010). "On the Iron Front: New Evidence from North-Central Africa". Journal of African Archaeology. 8 (1): 7–23. doi:10.3213/1612-1651-10153. ^ J. Cameron Monroe, Akinwumi Ogundiran, Power and Landscape in Atlantic West Africa: Archeological Perspectives, p. 316, ISBN 1107009391, citing Magnavita 2004; Magnavita et al. 2004, 2006; Magnavita and Schleifer 2004. ^ Peter Mitchell et al., The Oxford Handbook of African Archeology (2013), p. 855: "The relatively recent discovery of extensive walled settlements at the transition from the Neolithic to the Early Iron Age in the Chad Basin (Magnavita et al., 2006) indicates what enormous sites and processes may still await recognition." ^ a b Appiah & Gates 2010, p. 254. ^ Fanso 19; Hudgens and Trillo 1051. ^ Barth, Travels, II, 16–17. ^ Falola 2008, p. 26. ^ Falola 2008, p. 27. ^ Shillington (2005), p. 141. ^ a b Davidson (1991), p. 161. ^ Shillington (2005), p. 139, 141. ^ Shillington (2005), p. 198, 199. ^ Davidson (1991), p. 158. ^ Harlow 2003, p. 139. ^ Hirshfield 1979, p. 26. ^ Hirshfield 1979, p. 37-38. ^ Lengyel 2007, p. 170. ^ Mazenot 2005, p. 352. ^ Falola 2008, p. 105. ^ a b Kenmore 2004, p. 220. ^ Rangeley, Thiam & Anderson 1994, p. 49. ^ Kenmore 2004, p. 230. ^ Kenmore 2004, p. 215. ^ Kenmore 2004, p. 218. ^ a b "The World Factbook: Nigeria". World Factbook. Central Intelligence Agency. Retrieved 2013-12-31. ^ a b c d "The World Factbook: Chad". World Factbook. Central Intelligence Agency. Archived from the original on 2013-04-24. Retrieved 2013-12-31. ^ a b c d e f g "The World Factbook: Central African Republic". World Factbook. Central Intelligence Agency. Retrieved 2013-12-31. ^ "The World Factbook". www.cia.gov. Retrieved 2016-05-08. ^ Stefan Goodwin, Africas Legacies Of Urbanization (2006), p. 191, https://books.google.com/books?isbn=0739133489:"...and further west the even more numerous Sara [western Central African Republic, southern Chad, and northern Cameroon." ^ Peoples of Africa: Burkina Faso-Comoros - Volume 2 (2001), p. 86, https://books.google.com/books?isbn=076147160X:"The Central African Republic is a land of many different peoples... The Sara (SAHR) live in the grain-growing lands of the north as well as across the border in Chad." ^ "The World Factbook: Niger". World Factbook. Central Intelligence Agency. Retrieved 2013-12-31. ^ "The World Factbook: Cameroon". World Factbook. Central Intelligence Agency. Retrieved 2013-12-31. Wikimedia Commons has media related to Central Africa.